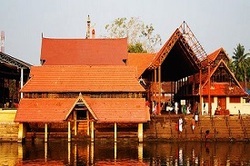 Ambalapuzha Sri Krishna temple is situated in Alapuzha district. Lord Krishna is worshipped here as Parthasarathy.It is believed that idol of Sri Krishna was brought from Guruvayoor temple and was kept in this temple by Tipu Sultan in 1789.It is considered famous for its architecture and is mentioned as one of the seven greatest vaishnava temples in Travancore. It is well known for boat race called Champakulam boat race. The temple is famous for Palpayasam, a divine nivedyam. Sabarimala Sree Dharma Sastha Temple, dedicated to Lord Ayyappa, is the most famous and prominent among all the Sastha temples in Kerala. The temple is situated in Pathanamthitta district at the hilltop which is unique in many respects. The temple is opened to all, irrespective of caste, creed or religion. There is a place near the temple dedicate to Vavar( a sufi and friend of Lord Ayyappa). Another interesting fact is that it is not open throughout the year. It is open for worship only during the days of Mandalapooja, Makaravilakku and Chitra Vishu. The pilgrims have to follow fasting of 41 days to cleanse their minds before going to Sabarimala.the journey to the temple is to be taken through difficult paths in the forest as the vehicles can go only up to Pampa. Guruvayoor is one of the most sacred and important pilgrim centres of Kerala. Its main attraction is the Sree Krishna Temple, considered the Dwaraka of the South. This historic temple is shrouded in mystery. According to belief, the temple is the creation of Guru, the preceptor of the Gods, and Vayu, God of the winds. The eastern nada is the main entrance to the shrine. In the Chuttambalam (outer enclosure) is the tall 33.5 m high gold plated Dwajasthambam (flag-post). There is also a 7 metre high Deepasthambam (pillar of lamps), whose thirteen circular receptacles provide a truly gorgeous spectacle when lit. The square Sreekovil is the sacred sanctum sanctorum of the temple, housing the main deity. Within the temple there are also the images of Ganapathy, Lord Ayyappa and Edathedathu Kavil Bhagavathy. Renowned for its healing powers, people make an astonishing range of offerings here to the Lord. One of the most popular offerings is the Thulabharam, where devotees are weighed against bananas, sugar, jaggery and coconuts equivalent to their weight. Only Hindus are allowed inside the temple. 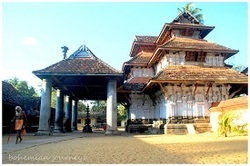 Chottanikkara Temple is one of the most famous temples of Kerala. The temple dedicated to Goddess Bhagvathi is located in Ernakulam District of Kerala. It is the most important Temple among the 393 shrines spread over 3 Districts of Kerala and coming under the administration of Cochin Devaswom Board. It is one of the most visited shrines of Kerala. People with mental illness visits this temple as it is said that Goddess Bhagawati cures the illness of the devotees.The Divine Mother known as Rajarajeswari (Adiparasakthi) is worshipped here in three forms Saraswathy in the morning, Lakshmi at noon and Durga in the evening. There is an Idol of Mahavishnu on the same pedestal. Along with Lakshmi & Narayana there are idols of Brahma, Siva, Ganapathi (Ganesh), Subramanya and Sastha on the same pedestal. There are two main temples here. The first one we see as soon as we enter is the temple of Rajarajeswari. The one behind it in a slightly lower elevation is called Keezhekavu, which has Bhadra Kali consecrated there. The Rajarajeswari is worshipped as Goddess Saraswathi in the morning, as Bhadra kali at noon and Durga in the night. This temple opens its doors every day at 4 AM. People believe that Goddess Mookambika of Kollur attends the first worship here before going to her temple. Another peculiarity of this temple is that the Goddess is not fixed to the ground but rests on a bed of sand. Vaikkom temple is located in Kottayam district having both deity of Shiva, Vishnu and is termed as Vaikkathappan. Ettumanoor Siva Temple, Kaduthuruthy Thaliyil Mahadeva Temple and Vaikkom temple is considered a powerful trisome. It is believed that if a devotee worships at these three temples before ‘Ucha pooja ‘(afternoon pooja), all the wishes are fulfilled. Vaikkath Asthami is the festival celebrated in this temple. 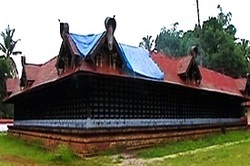 Ettumanoor temple is situated in Kottayam district of Kerala. The main deity worshipped here is Lord Shiva. Legendary belief tells that demon named “Khara” worshipped Shiva and he got three shivlingas from Lord Shiva. He hold each of the Shivlingas in hand and the remaining one in mouth. In Vaikom he placed one of shivalinga and which got fixed itself and was unable to move, this place later termed as Vaikkom mahadeva temple. Khara placed other two shivalingas at Ettumanoor and Kaduthuruthy. Visiting these three temples in one day is considered as propitious. Thiruvairanikkulam Mahadeva Temple is located in Aluva taluk in the district of Ernakulam and the presiding deity is Mahadeva or Lord Shiva and Goddess Parvati temple located about 15 km south of Aluva, in Ernakulam district of Kerala. The presiding deity is Lord Shiva, who is worshipped as Mahadeva. The Lord faces east and the separate shrine for Goddess Parvati facing west in the same sanctum. The unique feature Thiruvairanikulam Temple is that the shrine of Lord Shiva is open all round the year; but, the temple of Parvathi is open only for 12 days in a year. Thiruvanchikulam Mahadeva Temple is remarkable for its number of representations of Shiva and its 2000 year old temple. Its history is connected to that of the Chidambaram Nataraja. Sundaramoorthy Nayanar, the saint-poet who sang at Chidambaram, was persuaded by Cheraman Perumal (ruler of the Chera Empire) to visit Thiruvanchikulam and, when he sang here, it is said that the sound of the lord dancing could be heard within the srikovil. Shiva is seen as Gopuram Thevar (lord of the gateway), Dakshinamoorthy, Pasupathy (lord of all animals), Natakkal Shivan (lord of the doorway) and Konnakkal Shivan (Shiva at the foot of the konna tree). The konna (Indian laburnum) shading this last idol is said to flower all year round, unlike ordinary konna trees, which flower in February-May. And indeed, this tree was blooming in October. In the inner prakaram Shiva is seen as Sandhyavela Shivan (lord who is worshipped in the evening), Palliyara Shivan (Shiva at rest), and Unni Thevar (Shiva as a child). Old murals include one near the Palliyara, or sleeping quarter, of Shiva and Parvati in an amorous pose. Shiva and Parvati are laid to rest every night in the Palliyara. The temple is one of the most important center of serpent worship in Kerala.Situated near Harippad, this is a serpent shrine under the patronage of a brahmin family, headed by a priestess. The ancient shrine is an internationally renowned pilgrim centre dedicated to the Serpent God Nagaraja. Sarpa Yakshi and Naga Yakshi are the beloved consorts of Nagaraja. It is believed that Nagaraja as the installed diety is endowed with the form of Hari (Lord Vishnu) and the spirit of Lord Shiva. Legend has it that the first priestess of Mannarasala gave birth to a five-headed snake, which is believed to reside in the ancestral house to safeguard the family. At Mannarasala barren women are believed to be blessed with children and a special turmeric paste available at the shrine is credited with powers to cure even leprosy. Vadakkunathan temple is one of the ancient and largest temples of Shiva located in Thrissur.Thrissur owes its name to Sri Vadakkunathan, the Lord Shiva.This temple was considered as the first Shiva Temple developed by Lord Parasurama. The local people recognize the lord Shiva as Vadakunnathan. The gigantic Vadakkunnathan Temple is right in the heart of Thrissur city, which is widely known as the city of the Sacred Shiva and many other idols are placed in and around.Placed in a picturesque hillock, the temple has beautiful surroundings and is included among one of the oldest temples in Kerala.Thrissur Pooram, the most famous festival of Kerala is hosted by Vadakkunathan Temple.The temple promote many temple arts and cultural performances.